It has been more than 50 years after Bob Dylan cautioned older generations that the times they were a changin’. Not even the troubadour prophesizer could have anticipated the epochal societal transformation wrought by technology and the internet, which has changed the way people communicate, shop, view content, and even invest. But it’s hardly a young person’s province anymore. According to Spectrem Group’s recent research, older people are increasingly assimilating social media and mobile technology. They may generally not be “first adapters” of the latest gadgets, but notions that they are tech-averse are as outmoded as jokes about older people not being able to program their VCR.2016 Millionaire Investor: Using Social Media and Mobile Technology in Financial Decisions finds that social media and mobile technology usage among Millionaire Baby Boomers and those of the World War II generation ages 71 and up (with a net worth between $1 million-$5 million, not including primary residence) has markedly increased as this decade has unfolded. In 2010, just 29 percent of Millionaire Baby Boomers were on Facebook as were 17 percent of seniors. In 2016, Spectrem research finds that 58 percent of Millionaire Baby Boomers are on Facebook along with 52 percent of the WWII generation investors. Usage of LinkedIn, the less social and more professional online network has also increased substantially since 2010, when 18 percent of Millionaire Baby Boomers reported using it. This has increased to 39 percent in 2016. Similarly, only 9 percent of seniors reported using LinkedIn in 2010, compared with 21 percent in 2016. On the 140-character front, Twitter usage has tripled in the past six years among Millionaire Baby Boomers. Millionaire seniors have still not embraced Twitter as they have other social media platforms, but while usage is comparatively small (only 5 percent), it does represent a near 70 percent increase over 2010. 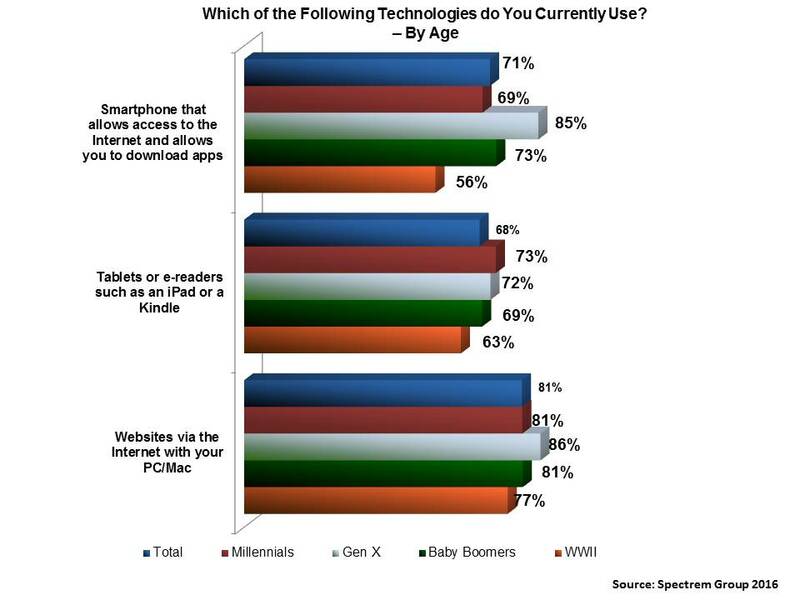 When it comes to mobile technology, at least two-thirds of Millionaire Baby Boomers and more than half of Millionaire seniors report they use a PC/Mac, smartphone and tablet, but they are lagging behind their younger counterparts in using them for more common financial activities such as for an airline boarding pass, to pay for daily incidentals such as coffee or pastries, or to pay at restaurants and grocery stores. Conversely, both age groups are more likely than younger Millionaires to use their PC/Macs to follow the news, check their account information, obtain market updates, conduct investment research, obtain advice from financial experts, and to read articles on financial topics and products. Millennials are generally more likely to use their tablets and smartphones for these and other activities. · Make your websites and apps accessible for all ages. An unhappy experience could send investors to more user-friendly competitors. · Make sure your content appeals to a wide range of ages with articles, blog posts and videos that would engage older users as well as Baby Boomers and younger generations. · Conduct “tech-support” sessions with your investors on how to use their smartphones or tablets to help familiarize them with its features. Show them how to easily access information from your site.